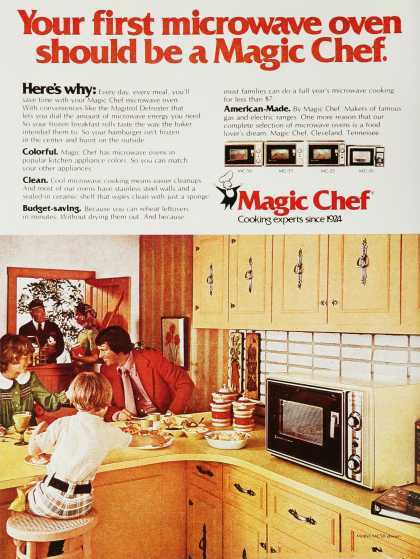 As America heads out of its collective kitchen this weekend to the unofficial national grill-a-thon, KBCULTURE stays behind to reflect on an appliance that liberated many a home cook from slaving over a hot summer stove. The happy bunch pictured above, for instance, is enjoying a 1970s version of quality time [note lack of iPods, -Pads, et al] courtesy of the technological marvel that was the microwave. It certainly wasn't micro in size, although its counter-dominating bulk didn't seem to bother this family. And while they might look like inhabitants of Anytown, USA, they were actually quite the elite group: the Bureau of Labor Statistics reports that in 1971, less than one-percent of households owned this now-ubiquitous appliance.